A Tactical Ground Station Humvee is parked during a training exercise at Fort Huachuca, Ariz. 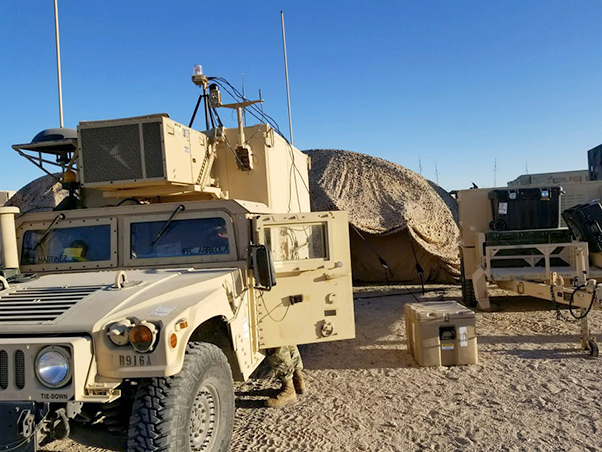 Soldiers with the 504th MI Brigade utilized the TGS vehicle to pull satellite and live videos feeds into the 3rd Cavalry Regiment Tactical Operations Center at the National Training Center. Soldiers with the battalion’s Expeditionary Processing, Exploitation and Dissemination Team deployed to the National Training Center at Fort Irwin, California, in February to augment the 3rd Cavalry Regiment with intelligence collection and analysis. The 3rd Cavalry Regiment was participating in the Decisive Action Rotation 18-04, where they battled the Opposing Forces of the U.S. Army’s 11th Armored Cavalry Regiment. Specifically attached to the 3rd Cavalry’s Regimental intelligence section, the Geospatial Intelligence Soldiers provided imagery support during the rotation. Using satellite imagery and live video feeds from Unmanned Aerial Systems, the GEOINT Platoon analyzed images, stationary and moving targets and geospatial data to produce intelligence. They can also determine the location and dimensions of objects on the ground using overhead imagery. A key role in the regimental Tactical Operations Center is processing real-time video feeds, known as Full Motion Video, coming from unmanned aerial systems like the Gray Eagle. 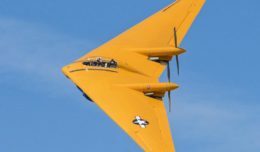 “The brigade or squadron commander really like to be right there in the fight, and the (Unmanned Aerial Systems) gives them that ability to see what’s going on in specific areas of the fight in real-time,” Bauer said. 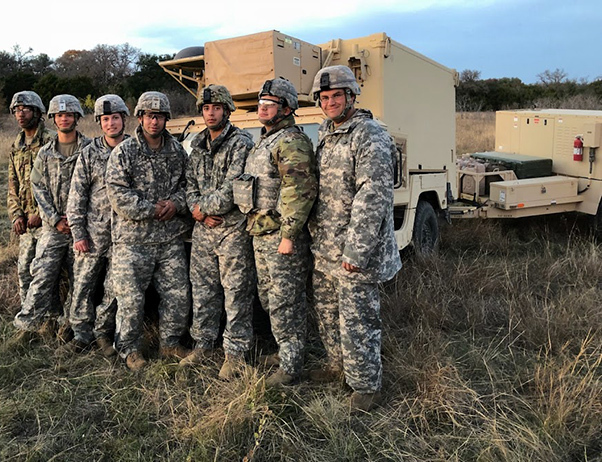 Soldiers with the 303rd MI Battalion, 504th Military Intelligence Brigade used the Tactical Ground Station vehicle to augment the regimental intelligence section for the 3rd Cavalry Regiment at the National Training Center during Decisive Action Rotation 18-04. 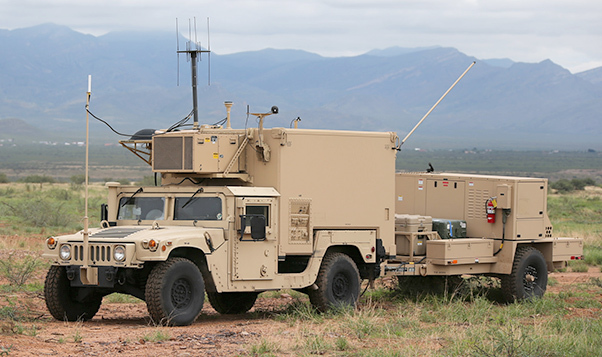 While at NTC, the Soldiers also utilized the Tactical Ground Station, a mobile collection platform mounted on an Army Humvee and part of the Distributed Common Ground System-Army (DCGS-A). Feeds from the TGS are fed to Soldiers working in the Tactical Operations Center, and also provide a “jump” capability to rapidly move the center to a new location in a combat environment. Martinez said the five junior-enlisted Soldiers on his team not only gained valuable knowledge of the systems, but learned how to mix into a battle staff. “We learned how to integrate more with their regiment. (The 3rd Cavalry Regiment) also got a better understanding of our capabilities and what we produce on the battlefield,” Martinez said. For Spec. Caleb Ditmore-Quick, a GEOINT shift leader during the rotation, the training allowed him to focus on his leadership and maintenance skills necessary to operate the platoon’s equipment. This rotation was his second time at the NTC, and he said his company commander wanted inexperienced Soldiers to deploy to learn the systems in a combat scenario. 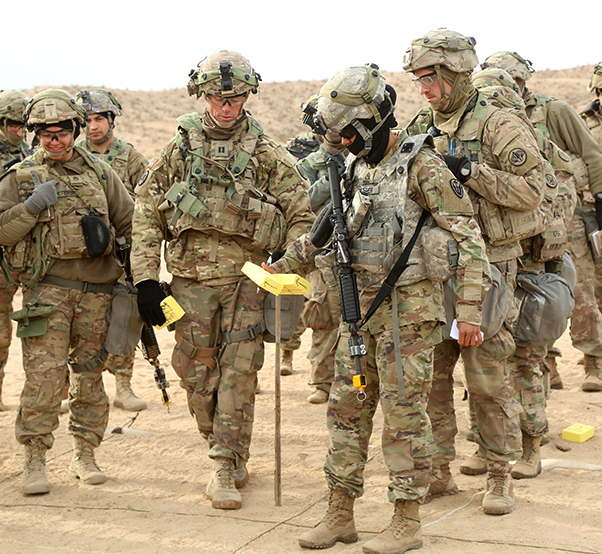 A Soldier with the 504th Military Intelligence Brigade (front right) stands at a terrain model with a group of 3rd Cavalry Regiment Soldiers during training at the National Training Center in late February. The specialist said working in the regimental operations center was hectic, but provided opportunities for the intelligence Soldiers to create valued products for the regiment and its command team. As part of their schoolhouse training, Geospatial Intelligence Soldiers also learn to identify vehicles, military equipment and aircraft, and even ships and submarines using overhead imagery. “We take the video and we see what’s going on. We exploit it by saying that’s this vehicle or these are guys setting up at a berm, and then we disseminate that to whatever element needs it the most, so that they can action the objective,” Bauer said. Martinez said much of the rotation was spent training the Soldiers on repetition and troubleshooting. Before the February NTC rotation, Martinez said his team worked with the 15th Military Intelligence Battalion to link into their Gray Eagle aircraft and learn how to pull video feeds into the TOC. Those feeds are often the ‘lifeblood’ of a Tactical Operations Center, and Martinez emphasized the importance of staying vigilant in the TOC to process, analyze, and ultimately, disseminate intelligence to commanders. “You really can’t look away from the screen. You have to have eyes on, because if you take your eyes away from the screen, you’re going to miss something and that’s something that could get somebody killed. When we have the capabilities, and intelligence is coming in, it’s all hands on deck,” Martinez said. Soldiers with the Geospatial Intelligence Platoon, 303rd Military Intelligence Battalion, 504th Military Intelligence Brigade pose for a group picture during a fall training exercise with the 3rd Cavalry Regiment at Fort Hood.